I've been tracking the Lennox case for days now. Truth be told, I only came across it in the news I was browsing. Rumpy, DogsNPawz and Bringing Up Bella have posted their thoughts about Lennox's execution. All I can say and will say over and over again about the Breed-Specific Legislation is that it should be named the Bul*Sh*t Law because that's what it is. One of the things I hate about authorities claiming that they are only concerned of the public's safety is that they're mostly full of crap. 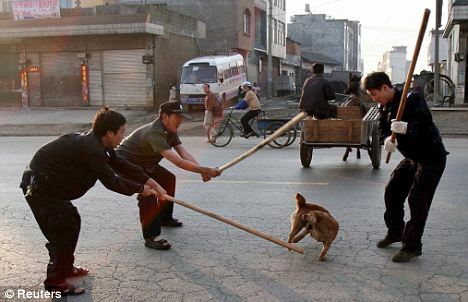 The authorities in the Belfast City Council said this, so did the authorities who've confiscated thousands of dogs from Jiangmen- some of which were brutally executed in public streets through stick beating. Our aim is not to kill all the dogs in the city's urban areas, but we hope to create a better environment for the city by banning the keeping of dogs. Whilst there is an exemption scheme to which dogs of this type (pit-bull terrier type) may be admitted as an alternative to destruction, there were no such measures that could be applied in this case that would address the concerns relating to public safety. Today, I am Lennox. 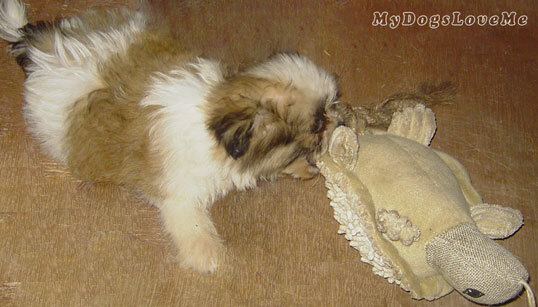 In behalf of our pack, Chooey is Lennox. Chooey bites, barks, plays and haves fun like a dog. OMD, she has Pit Bull type traits like Lennox! That case made me sick to my stomach. You're so right, it is the bull sh*t law. Dogs are not born evil no more than people are. People create evil and something needs to be done. I know, this is just heart wrenching! From the mom - as I am on Facebook, I have been reading a lot about what Lennox went through since he was snatched from his loving family. To me the cruelest part for the family was to keep him alive for so long while the faily put their all into fighting it - all for nothing. 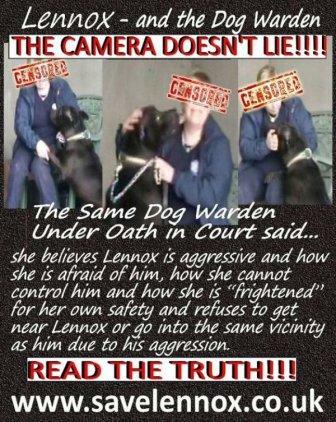 Belfast City Council planned all along what they end result would be - I truly believe they would not allow anything to change their mind - case in point - Victoria Stilwell even offered to take Lennox to the US to rehome him here. To me, thaat seems a wise thing - why was it not allowed? Because the Council wanted to show they were in control - they knew best - their mind and their hearts were closed; they didn't care anything about the family or Lennox. Also, letting Lennox go would have been admission that they (the Council) were wrong - you don't want to do that if you want to maintain control. Yes, this whole story of what BCC did makes me sick - I would not step foot there. No one who has commented on their FB page had a kind thing to say about them. I pray the story lives long and worldwide. It is God's way to forgive - not mine but I think God would have a difficult time forgiving someone who has needlessly and senselessly murdered a creature that He gave his own name to - DOG = GOD spelled backwards. I agree. That's what I thought all along. The BCC had no plans of changing their minds. They should've just ended it rather than make the family suffer if this was the case. When I first read about Lennox, I was very upset and angry. And I am still upset and angry today. And will probably be upset and angry for a long time coming. It's total crap to label a dog aggressive just because he's of a certain breed. Breed specific legislation are such crap! As for poor Lennox's plight at the hands of those idiots ... I am saddened, disgusted and angry, all at once. It's sheer evil. Mom Kim from Fuzzy Tales: I'm not aware of this case and I'm sure I don't want to read the disgusting details. Here in Ontario, Canada, we do have breed-specific legislation, primarily related to Pit Bulls. I'd have to research it to find out it applies to other "aggressive" breeds. I had thought this might be repealed, actually, but don't know where that stands. I do know that there IS a Pit Bull "underground" here. A former co-worker helped get a couple of pit bull crosses out of the province several years ago, on separate occasions. Took part in the transport, I mean. In fact, ANY dog can be aggressive, depending upon circumstances, whether it has a high prey drive (as an individual dog, I mean), how it's been raised, etc. Gees, the meanest dogs I come across are the small breed ones that people treat like toys or babies, and don't feel need to train. Unfortunately, this can be quite true. I even came across a bite statistic suggesting the retriever breeds as having the higher tendency to bite as well as attack which is why socializing them is important. I am glad this has opened your mind to further research on it. We, as pet owners, should be aware of this even if our breeds aren't BSL material. Oh my God, I can't bear to see things like that. The Northern Ireland First Minister, where Belfast is, and which is part of the UK, spoke out against this terrible action, but it just shows how much sway he has. The BSL was passed by the UK parliament 20 years ago and was a knee jerk reaction to the fact that some people and some kids had been attacked by Pit Bull type dogs. In every case the dog that attacked was owned by a human that treated the animal badly or tied it up a lot of the time or neglected it, or worse, had the animal as their weapon of choice in street violence. So instead of charging the owner they target the animals. It is ludicrous, unfair and very short sighted. Lennox was a family pet and I am sickened by the whole thing. No doubt, Lennox, having been incarcerated for two years would have been traumatised and damaged by his experience. Yes! This is true. It is like being imprisoned in unhealthy conditions only to end up being murdered for a crime you didn't even do. It's so wrong that these kind of laws aren't abolished. BCC simply wanted to show that they were in control/ power which is pretty disgusting. The whole thing is heartbreaking ...rest in peace, Lenox. I am so sick over this. Lennox will not be the only one to have this happen to if people who rule these lands- remain in control. I hate those people who did this awful thing. I won't say what I wish would happen to the evil peoples, and laws. Run free Lennox- we remember you always. It's sickening and heart wrenching to think that this is perfectly "okay" to some people. Just heartbreaking. Ugh, I was with Lennox from the start- I've sent numerous emails and signed petitions but alas I'm sure BCC had decided long ago about what to do with Len, poor lad. JUDGE THE DEED NOT THE BREED!